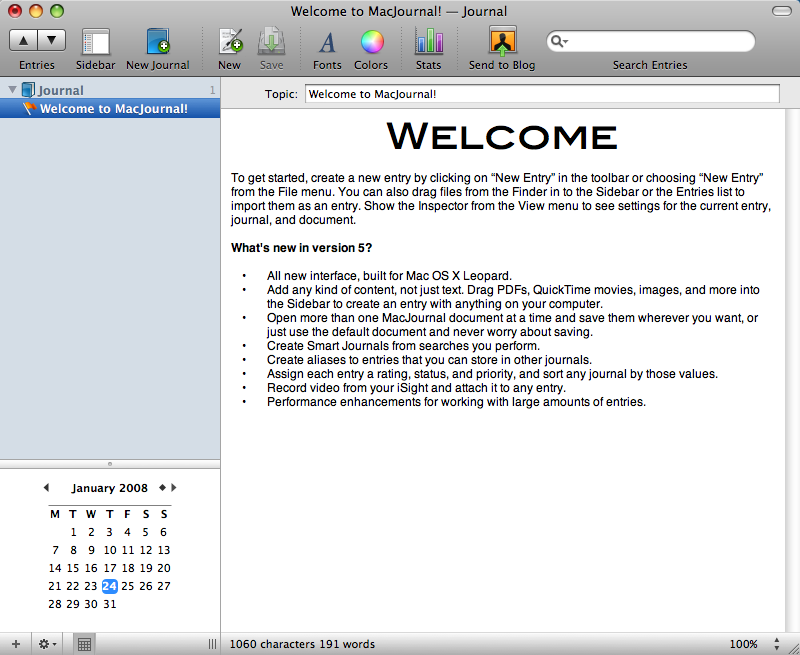 Recently, I have taken even more heat for my comparison of Journler and an outdated (but free) version of MacJournal. Because Mariner has recently released a new version of MacJournal and Journler is (to my great chagrin) becoming shareware, I have decided that a rematch is in order. 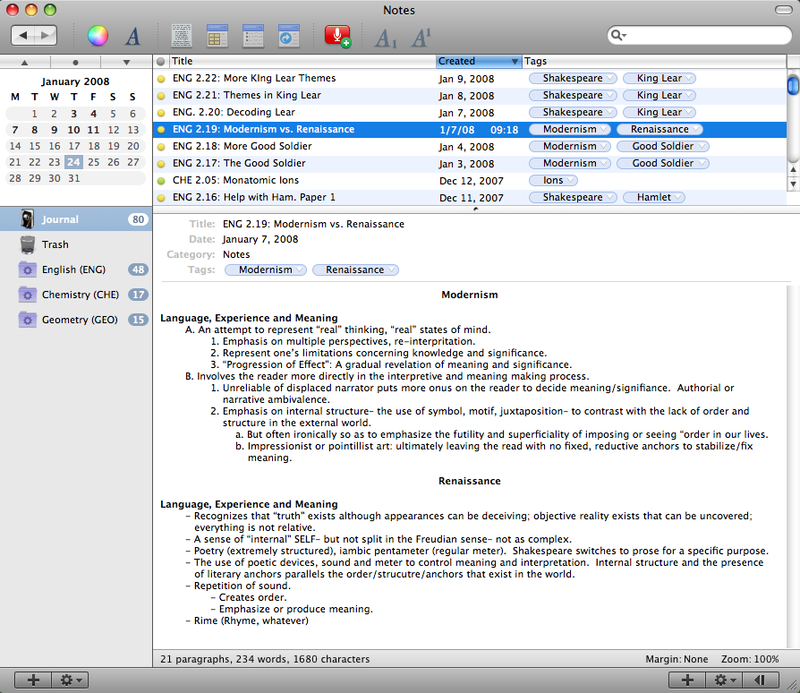 However, I may wait until the first non-freeware version of Journler becomes available. In another review I declared Vienna the better RSS reader. However, several months ago I picked up the NNWL alpha/beta/something and really liked it. So, imagine my delight when it was announced that the full version of NetNewsWire was going free. Because of the much-improved (and Leopard-like) GUI and the full range of features available in the full version, I am now a convert. Although I am considering it, I probably will not write another review of the two apps. Also, expect rundowns on IRC clients (this one may have to be a three-way match) and alarm apps (there may be four contenders for this one). Stay tuned, these should be up soon. As you can probably tell from my recent influx of Chef RPG-related posts and the fact that I was watching cooking shows at 3 last night, I am more into cooking than usual. 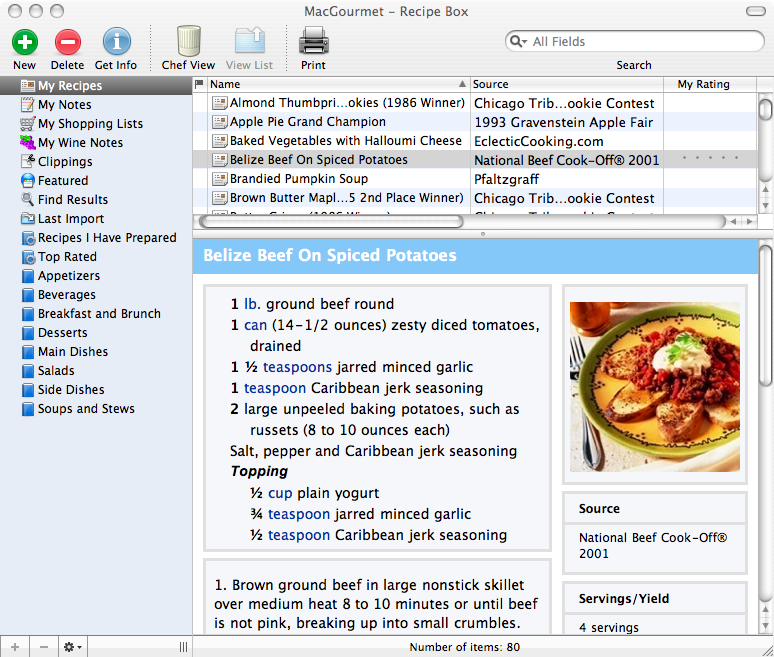 So, seeing as how there are just about as many cooking apps are there are RSS readers for Mac I decided to review two of the more prominent ones. This Software Sumo will be a little different because I am not going into it with a clear preference. Also, rather than having Freeware vs. Lite version of shareware like usual, we will have two paid apps facing off. Both apps have a fairly basic interface. We have the conventional three-pane view with a sidebar containing folders, a top pane with recipes and a bottom pane that displays the selected one. 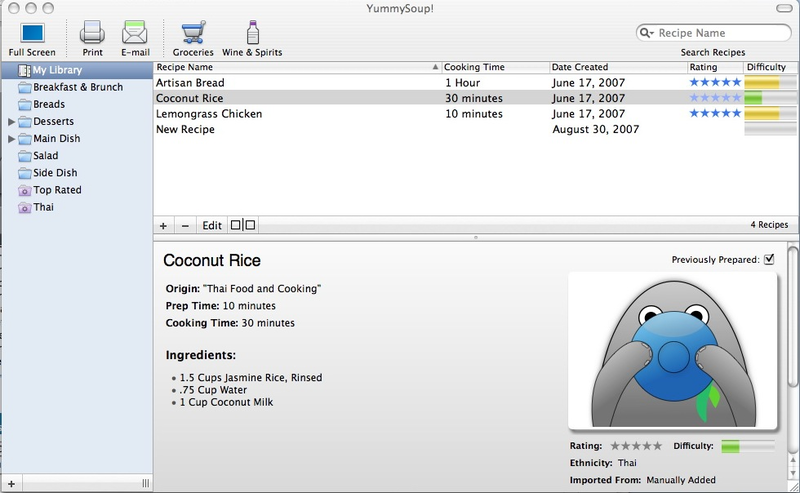 Although it seems like a silly thing to say, I must point out that I prefer the default proportions of YummySoup! better. Overall, the YS! interface seems more polished and modern. One thing I like about MacGourmet is the ability to choose different layout styles for the recipes (akin to message views in Adium). In YS! there is a “browse by image” option that is rather Cover Flow-esque. My main (and really, only) issue with the YS! interface is that damn seal thing. I appreciate that they let you change the default recipe image but it still lurks around. If MG did that I wouldn’t mind because I like their icon. YummySoup! : 8/10 – Despite that stupid seal this is a very good interface. MacGourmet: 7/10 – Good, but feels a little cluttered and rough. Both of these applications have all of the things you would expect from a recipe keeper. They have a full-screen (or large) view, ratings, difficulty, pictures, shopping and wine lists, etc. Most of these things I will never use, and may even consider as bloatage but its always nice to know that I can plan my wines in advance. 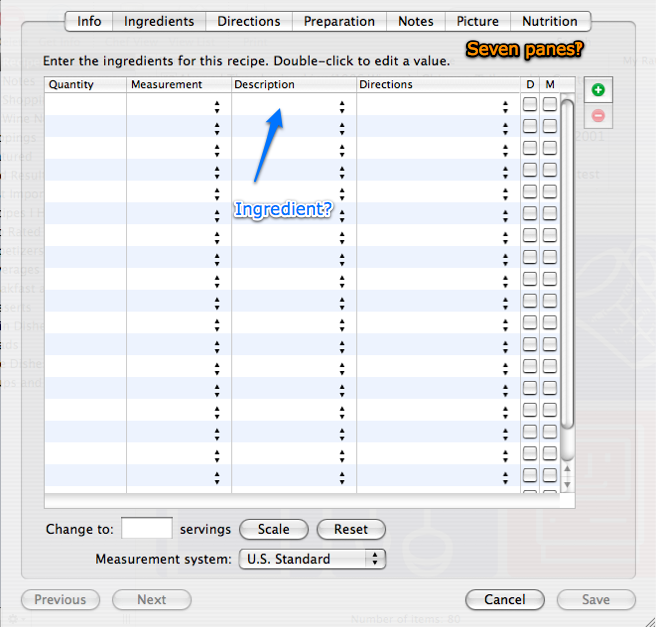 The recipe adding interface, arguably the most important part, is where I noticed the greatest difference. YS! has a very simple, one-paned design with handy autofill (configurable in the menu), MG, on the other had is a complicated jumble. In fact, the MG interface was so unintuitive that I wasn’t even sure where to put the actual name of the ingredient. I also don’t get why MG needs a whopping seven panes to get done only slightly more than what YS! can do in a single one (MG allows you to enter tools and nutritional information). YummySoup! : 10/10 – The only feature it lacks is someone to cook the food for you. MacGourmet: 8/10 – Same features, but many are poorly executed. YummySoup! : 18/20 – A better application at a lower price. I’d go with this one. No doubt. MacGourmet: 15/20 – Not only does it cost $5 more but its harder to use. Thank you, and join us next time when we’ll review assignment trackers, just in time for back to school! Just to start off with a clear air I will admit right now that I am a diehard Vienna fan and not big on NNWL. My personal preferences aside, let the match begin! Many people don’t like Vienna’s interface but I personally find it acceptable. 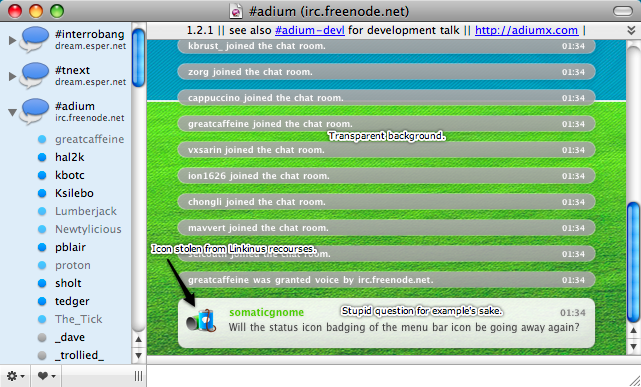 For those of you who don’t know NNW (but not Lite) recently received a interface lift. Let’s take a look at the two apps now. My biggest issue with NNWL is its interface. I can’t pin down a single part of it that annoys me but I find the whole package to be rather off-putting. However, this is purely a visual thing, I think the interface is perfectly navigatable and consistent with other OS apps. I think for someone who is less of an aesthete the NNWL interface will do fine. 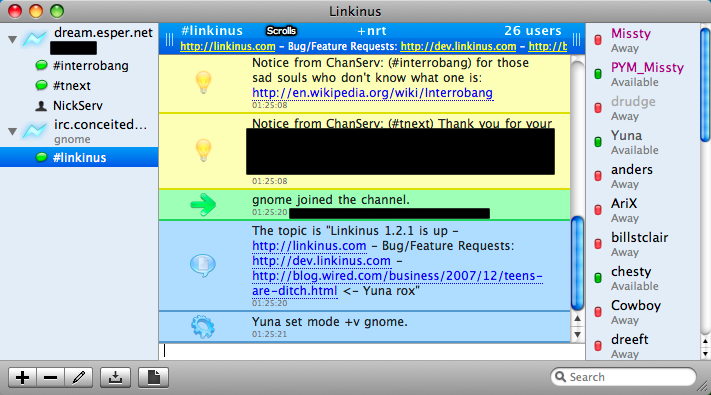 (The interface is also much improved in the new version of NNW). One last little minor thing that I don’t like about the NNW(L) environment is the non-standard dock badge (which you can judge for yourself). As I said earlier, many people take issue with the Vienna interface. 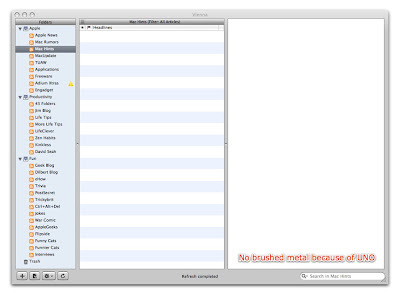 Two issues that tend to repeat are the brushed metal and its inconsistencies with the standard OS X environment (namely, the controls at the bottom and the thick window border). Strangely, for all of my love of consistency these things don’t bug me. This may be because I like my news-reader to be more of a widgetesque app (a simple program that is is simple and streamlined). 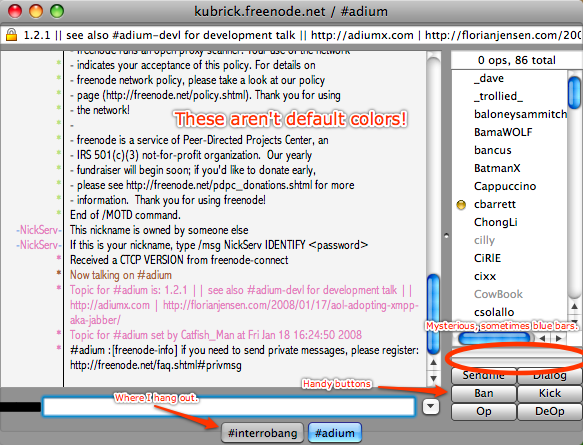 One option that people like about Vienna is the three-column view (shown) that is not available in NNWL. Yet another nice thing about Vienna is the option to use different styles. 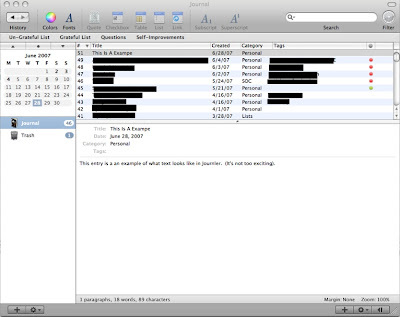 NewNetWire Lite: 7/10 – An intuitive but less-than-gorgeous interface. Vienna: 8/10 – A controversial interface that I feel is diverse and effective. Now, even though I’m not big on bloated feature-full RSS readers I know some people are. I’m sorry to say it but Vienna wins out here too. Although free, Vienna has many of the features that are in the full version of NNW but absent from the Lite one (these include an integrated browser and a bunch of other stuff). Of course, you could shell out $30 for a couple more features and an interface you may find more appealing but unless you have a hedge fund to burn I’d suggest Vienna for features. NewsNetWire Lite: 7/10 – Has the features I need but not enough for everyone. Vienna: 9/10 – The developer(s) could make good money with features like these. Vienna has one with a fairly slim lead. I feel that this is one that is really up to the user. It depends what you are looking for in an reader. Please share you opinions. 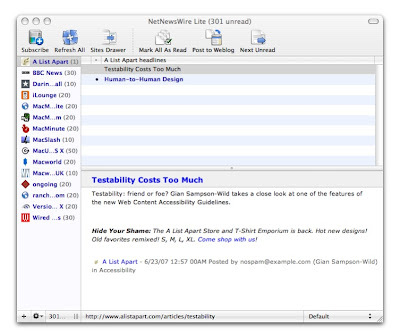 NewsNetWire (Lite) – Lite is free, $29.95 for the full version. P.S Ignore any misspellings…it’s complicated.